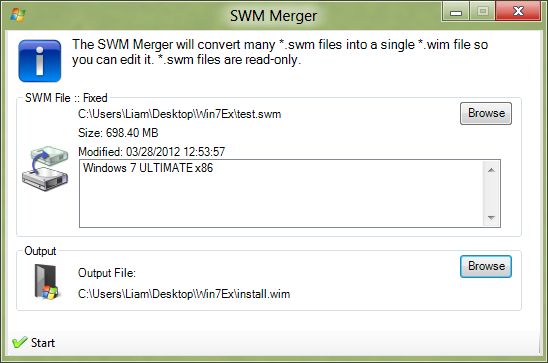 SWM Merger is the tool where you can merge smaller *.swm files into a larger editable install.wim. Select the location where you want your new install.wim to go. It's built in WinToolkit. Look in Tools tab. 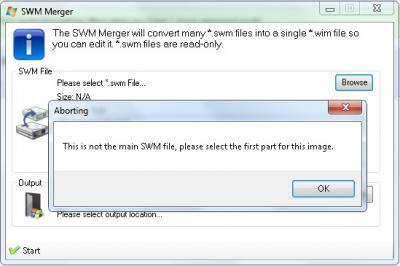 I need to merge two files Install.swm and Install2.swm....and that happens (see the pic)....what Im doing wrong? 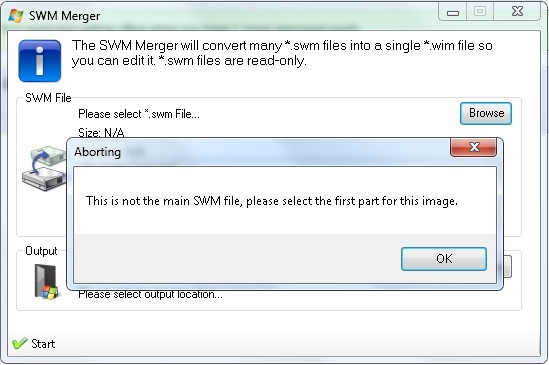 I want to merge two files install.swm and install2.swm...and that happens (see the pic)...What Im doing wrong?? The 'Driver Installer' lets you install any driver either from driver packs or you just have an updated driver to the computer currently installed (Live). Note: *.inf files with the same MD5 will not be added, this avoids installing the same driver. Once your files have been added, click 'Start' and W7T will start installing the drivers on your computer. Wait may take some time to install all the drivers, so go for coffee, cup of tea or whatever you prefer. W7T will let you know when it's done. This will check which drivers are already installed via on your live system. Tick the boxes next to the drivers your want to remove. Now all you have to do is sit back and wait for those obsolete drivers to be removed, W7T will update the list once completed. XP and Vista users: You will need to use the DISM Installer in order for W7T to work on your Operating System! 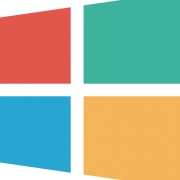 Windows 7 Toolkit is a program designed to help you integrate your Updates, Drivers, Theme Packs, Tweaks, Wallpapers, Addons, SFX Installers, Gadgets and remove the things you don't want from your Windows 7 Image. Tools Manager is the main window for Windows 7 Toolkit, there are many tools which you can select. This is the greatest tool in W7T, it's let you integrate, Addons, Remove Components, Drivers, Gadgets, Language Packs, Edit Services, Silent Installs, SFX, Theme Packs, Tweaks, Updates and Wallpapers! SoLoR works very hard and providing ALL the updates released since Service Pack 1 so he should get credit for this, this little tool lets you easily download his updates which Microsoft has released via Windows Updates but more importantly which Microsoft has also released privately and which are not released via Windows Update. This will install updates on your currently installed system, probably mostly used by those who use SoLoR Updates. This tool also lets you uninstall old updates too. This has links to the most popular downloads you should need for W7T. The 'All-In-One Disk Creator' lets you create all in one disks, so for example you can have Windows 7 SP1 x86 and Windows 7 SP1 x64 in disk, you could further include Vista or 2008 server if you wished. Step 1: Select your first image. Press the 'Browse' button again and select your second image, you should now see even more images added. You can keep hitting browse and add more and more images until your ready. Optional 2: Delete the images you dont want! W7T will then merge all of the images together, it will also try the best it can to resolve name conflicts however you may have to use the 'Edit' button and change some names to that NONE of them are the same, don't worry about descriptions, they won't conflict. WARNING: It is really important that none of the images have the same name, W7T will try for example add 'x64' or 'x86' to the names of the images to remove conflicts, however sometimes this is not enough. You can choose to rebuild your newly created image so that it can produce a smaller ISO. Self-explanatory, make a new ISO with your new creation. Usually an image is locked to one edition i.e. Ultimate, so when it comes to install you don't have the option of choosing. Unlocking them will ask you which version of Windows you wish to install after booting from the ISO/USB. This will copy the 64bit Recovery Mode files, so if something happens to your computer and it's 64bit, you can use this option. This tool lets you remove built-in Windows packages from your image, for example Windows Media Player, Windows Media Center or Internet Explorer. The difference between this and vLite is that this tool uninstalls them the official way rather than remove files the downside is that the image does not shrink as much as just removing the files. It also lets you remove old updates. WARNING: Anything you remove using this tool can't be undone, it is permanent! Step 1: When you first open up this tool you will be asked to select the image you wish to work with. Click 'Browse' and select the install.wim you wish to work with and then either click on the item Windows version you want and press select or just double click. Once done, the image will start to mount and retrieve all available packages within the image, it will not show ones which have already been removed. Note: You may notice that this list has more than the list available in 'All-In-One Integrator', this is because in the AIO i have only included the basics, whilst Component Remover will include everything, including updates. Once all the items have been listed, you can select the components you wish to remove. Red:This will break something, something depends on this feature but it will hopefully say what it is. Once you have everything selected, you can now click 'Remove Components', once done it will rescan and shows you what's left in the image. Once done, you can go ahead and close the tool, click 'Yes' and it will ask you if you want to save the image, i recommend you to 'Save & Rebuild', however if you are going to be working on more than one image then just rebuild once you're done with your last image. This will let you have you Windows installed unattended. It's not the most complete unattended out there but it's better than nothing. Luckily most of this is self-explanatory, note it is recommended to leave 'Architecture' set to 'AnyCPU' which means it should work for both x64 and x86 installs. The 'Users' tab lets your add pre-installed usernames on the computer, with passwords, user group, description, again self-explanatory. It is recommended to leave this alone unless you know what you're doing, since W7T does not have full unattended features it allows users to add their own entries and save them to a file, it also allows the user to see what will be saved. These serial keys are known as 'Default Keys', they are basically just used to make the install unattended by leave Windows de-activated and keeps the 30 day trial. WARNING: If you use a Ultimate serial key then you must install Ultimate otherwise it will error. 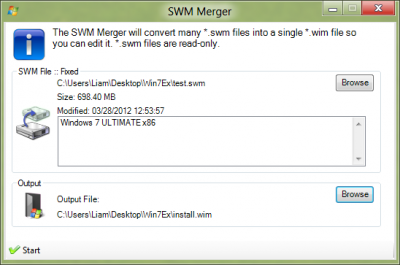 You can use the 'WIM Manager' to integrate a unattended file.